On June 7th, Orangewood Children’s Foundation, a non-profit organization dedicated to successfully transitioning emancipated foster youth in Orange County, graduated its 2012 class of foster youth who achieved a diploma, GED, or trade school certificates. Stanbridge College helped sponsor the Orangewood Graduation Ceremony and Dance to support the celebration of those foster youth who have overcome adversity to achieve their education through the Independent Living Program at Orangewood. 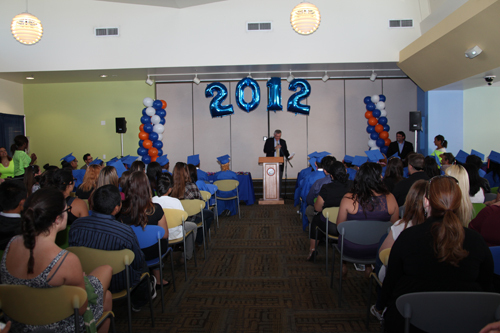 Stanbridge College partnered with Orangewood Children’s Foundation at their 2012 graduation ceremony for foster youth. According to the Orangewood Children’s Foundation, 46% of teens leaving the foster system have not graduated from high school; compared to 16% of the general population. The Foundation programs assist foster children and former foster children leaving the dependency system, strengthen at-risk families, and are designed to prevent and break the generational cycle of abuse. This is the second consecutive graduation ceremony Stanbridge College has helped support. The sponsorship is part of Stanbridge College REACH – Beyond the Classroom™ Service Learning and Civic Engagement initiative. Stanbridge College REACH partners with over 40 non-profits in Orange County and around the world to help educate its students on issues of need. REACH encourages the Stanbridge community to participate in a number of volunteer and donation activities throughout the year. To learn more about the Orange Children’s Foundation and how you can help its mission to support foster children please visit www.orangewoodfoundation.org. To learn more about Stanbridge College REACH please visit www.stanbridge.edu/reach.